Next August I will be holding a presentation for american ostomates – on the national UOAA conference, which will be held in Reno. My presentation will be about my adventurous life with ileostomy and view on life where I hope I can continue to spread the word about fun and adventurous life with ostomy. It will be a great experience to meet up to 700 people with similar experience and I am greatly honored to be a part of this. If interested, you can see information abut the conference here. Regarding other plans for this year it is unlikely that I will do any extreme challenges like last year. I will however probably travel to France with my family where I hope to learn to surf, along with “typical” touristic stuff. I also plan on climbing a ~400 meter (1300 feet) vertical cliff in the north of Iceland, which about only 10 teams (20-30 people) have climbed so far. If I do that, I will have to prepare well. Other adventures will hopefully appear randomly and if they will – I will embrace them and enjoy them. This year has however started with a very tight work schedule leaving little time for activities. Hopefully that will change soon. I did a presentation for the Icelandic Ostomy Association yesterday where I showed pics from my trip to the Alps along with other (hopefully) interesting stuff. At the end of my presentation, I played this video which showed what I’ve been up to for the last +2 years. That is, showing all the amazing things I’ve been able to do, thanks to the freedom and improved health I got after surgery. The video is in a “timely order” that is, starts with pics from hikes that I started taking 2 months after surgery and ending with pics from a hike I took just a week ago. In between there are all kinds of adventurous stuff, pics and videos, that I hope can be inspiring for other people with stoma. Page Update: After I finished documenting my trip to the Alps and publishing it here I somehow needed to take a break from the webpage. Now, almost two months later, I’m back and plan on continuing telling tales of my adventures, big and small. Also, I will continue writing about my thougts and experience related to my life with ileostoma. I don’t know how frequently I will post something here but hopefully something new will arrive every other week. I also rearranged the webpage so that you can have better access to everything I’ve already put in. For example, all my videos are now accessible below on the right. Publicity: I have gotten some publicity in Iceland recently, in TV and press. It was part of a publicity campaign that the Icelandic Ostomi Association. was doing. The campaign was made to increase peoples awareness of ileostomy and show them that life can actually be quite good with ileostoma. The TV interview was in a swimming pool and therefore showed more than before and seems to have gotten peoples attention, along with the other interviews. Also, there will be an interview in Coloplast’s next magazine, in danish, and there is a possibility of more foreign publicity, more on that later. Below is the video and the press article is here. Or maybe I was just stupid and lucky… But I really had a blast and that’s what counts. On day twelve I ended the “hyper adventure” part of my trip as I met my wife and daughter in Milan and we started the “family adventure” part which included staying in Milan and the Italian Riviera, visiting Monaco and Nice in France, and ending in London, UK. I was travelling for a total of almost four weeks but it truly felt like two months as it was so incredibly eventful and fun. Have fun in life and do things that scare you, or you believe you cannot do. You’ll be surprised what can happen. Day five was different from the other four. Simply because we did not have any peaks to climb. Our original plan was to go up on Dufourspitze, which is the second highest peak of the European Alps but, due to bad weather, our only option was to hike down. Other teams had also planned on going on Dufourspitze and other peaks but also needed to change their plans. Therefore there were a lot of people hiking down the same trail, back to civilization in Zermatt. The hike down was pretty long, around 13km through glaciers, crevasses (ísl:sprungur), big rocks and trails.I think it took about 8 hours. It was undeniably beautiful walking down, looking back at the mountains we had previously climbed and just enjoying the magnificent surroundings. 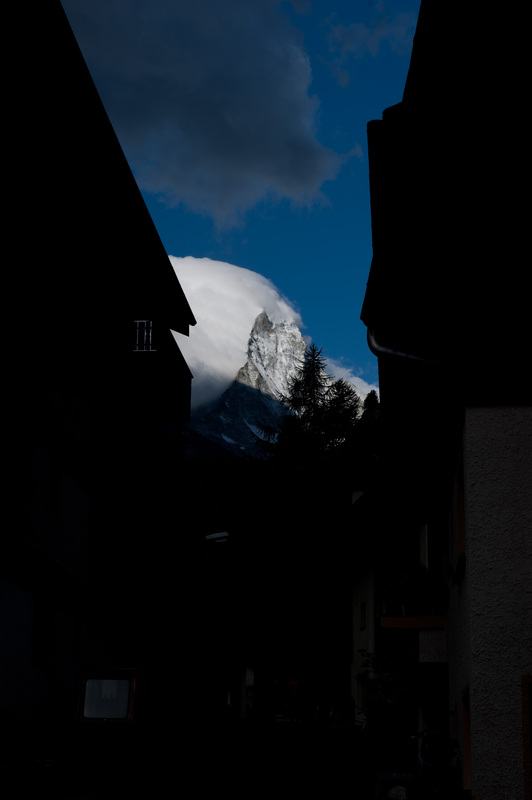 When we got to Zermatt, we sat down at the first restaurant we saw and got a pizza, soda and the guys had beer. It was great. We went to a luxury spa where we relaxed and enjoyed different types of saunas, rest areas and showers. Doing nothing was nice for a change and the three hours we spent in the spa really re-energized us. Our five-day warm up had ended and we were all ready to attack Matterhorn within days. But, after waiting for three days it was evident that the weather was not going to get better. Therefore, we decided to get out of Zermatt, out of Switzerland and go rock climbing in Italy. 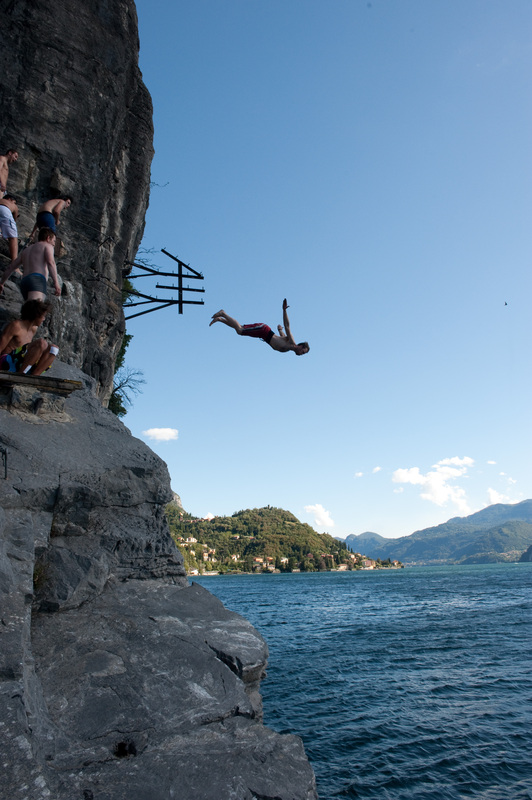 It turned out to be a great decision as we found some great climbing near Lago di Como, among other great things. More on that in my next post, which will probably be the last post about the trip. Day four started early for me, just over midnight after about 2 hour sleep. I felt like there were fireworks in my stomach and really didn’t feel good. My stomabag was also full and for the next hours I just laid in my bed trying to be comfortable along with going a couple of times to the bathroom. I finally managed to fall asleep and in total slept for about 3-4 hours. I realized that the energy gel that I took in twice the day before was something that I really, really could not handle. I even got soars in my mouth because of it. And so, day four didn’t start well and as I woke up I was having diarrhea. In short that means it is really difficult for me to get in energy as the food only stops for 1-2 hours in my body. In addition to that, I needed a lot more fluid and food than usual. Regretfully I didn’t realize this when we took off. Thankfully day four was always planned to be relatively easy as we would go up on two easy, nontechnical, peaks and would not have to return down as the hut we would sleep in was on top of the later peak. The hike up was however estimated to take up to 8 hours. When we got near the first peak, Parrotspitze (4.432 meters), I said I didn’t want to go up, as I was too weak and tired. Everybody somewhat agreed, as we were all tired after a demanding Lyskamm ridge the day before. Gummi and Maggi however decided to try out some version of ice climbing on the side of the peak and I offered to take pictures with Gummi’s big high quality camera. As we were taking the pictures me and Jón went higher and higher to get better pics and before I knew it, I was climbing up the ridge (ísl: hryggur) of Parrotspitze. Suddenly, on the ridge, I lost every ounce of energy in my body. My feet were shaky and I felt a bit dizzy. Stopping on the narrow ridge wasn’t an option so my only option was to get through it as quickly as possible, which took about 20 minutes, and quite dangerous as I felt like could just as well faint. Therefore I was quite alert for the danger of the situation and was also extremely frustrated that I had managed to put myself in this situation. On top of all of this, I still had the big camera that was dangling on front of me, weighting too much for this type of situation and thereby not making things better. “Ágúst!!! Picture!!!” . It was Maggi calling behind, It sounded like he wanted me to take pics… I was too afraid to turn in their direction to take pics so I just aimed the camera backwards and took a bunch of pictures, cursing them in my mind at the same time. It turned out later that Gummi wanted to get the camera so that HE could take pics. But that was after a lot of screaming in the wind and even a finger signal made by me as I had lost all tolerance for the “serious camera problem” they were so focused on while I was dealing with my dilemma. As soon as I got through the ridge I sat down and swallowed down on chocolate bar and drank a lot. That was all I needed to get energized and comfortable with this narrow ridge. Soon thereafter we stopped and I ate and drank a lot more. The funny thing is that now I cherish the pictures I took and really don’t regret hiking the peak, which was kind of the most dangerous thing I did, as silly as that sounds. The picture, which is below and turned out great, reminds me how my limits can really stop me but at the same time how far I can still go despite all of that. The rest of the hike was mostly uneventful except when we were reaching the hut on top of Signalkuppe 4,554 meters. There we saw a helicopter pick up a climber that seemed to have gotten severe height altitude sickness, and had to get down to civilization. The Margherita hut, situated on top of Signalkuppe, is the highest hut in Europe and is about 1000 meters higher that the hut we were in the night before. This is a lot in terms of height altitude sickness problems. We felt it when we arrived but got used to it quickly. I was also getting better in my stomach so our overall health was good in the end of the day. Were were however getting tired after four days in the mountains and started to look forward to getting back to Zermatt the next day. We started the day at 4:30, finally on time and somewhat fully rested… That is… Me, Maggi and Jón were fully rested but Gummi didn’t sleep at all the entire night, mainly due to excitement for the day to come, I think. I admit I was skeptical that he could do a 10 hour demanding hike on that day and I guess we all were. I guess we all also agreed silently that we were a bit afraid of the days project as we were going to hike and climb the Lyskamm ridge (ísl: hryggur) which is 5 km long and very narrow with 600-1000 meter freefall in both direction. The ridge included two peaks, Lyskamm West (4,467 m) and Lyskamm East (4,527 m) and therefore this would be our longest, most demanding hike as well as most dangerous. We didn’t know at the time but the day before two climbers fell to their death climbing the ridge. We also found out later that the mountain is known as the man-eater, as climbers have fallen through cornices (ísl. : hengjur) that had formed on the top of the ridge and climbers didn’t know they were actually walking on air. In short… we were going to hike and climb a 5 km ridge and there was little room for error. One failed step of thousands could cost us our lives. (I guess this sounds overly dramatic but this was actually just a fact.) The Lyskamm also had the same difficulty / danger grade as the Matterhorn. We did know that and I guess that was the reason we all approached Lyskamm with full respect. And so… with a knot in our belly we took off. For me the scariest part was hiking up on Lyskamm west as it was very steep and very very icy. One failed move would have taken both me and Maggi down without the slightest chance of stopping us with our ice axes. After we got up on the peak and started traversing the ridge (ísl: að þræða hrygginn) I went from alert to stupid and forgot about all the dangers and just enjoyed the experience. It was incredible, pretty much the most incredible mountain experience I’ve had . The weather was perfect, sun and no wind which made everything a lot easier, and less dangerous. After finishing threading the most exposed part of the ridge we hiked up on Lyskamm east to find out that there was a lot left to get down and rather demanding. The worst thing was that the snow had melted quite a lot, due to the sun, which made our decent (ísl: gangan niður) a lot more difficult. After getting on safe ground we hiked down to the Gnifetti Hut and after 11 hours of pure pleasure we were relieved to get some rest and gain some energy for the next day. I had no problems with the stoma except I ran out of food and water (I always needed more than the guys). Due to lack of food I took in energy gel which I had never taken before. This turned out to be a very bad decision as my stomach didn’t agree with my food of choice, which had effect on the days to come. More about that in my next post. The Gnifetti hut was great. We had a private room, with bunkers, and the view from the toilet window was amazing – With Lyskamm East gnawing above us and a fierce looking glacier below us. We ate a lot, prepared our gear and went to bed filled with wonderful memories from the last days. At this point I felt unstoppable and was full of confidence for the next days. My life is somewhat limited due to the fact that I have ileostomy, which I got after five years of colitis ulcerosa, which lead to colon cancer in 2008. The ileostomy has, however, given me freedom that I didn’t have before and therefore, with full health and only a stoma bag on my belly, I embrace life and try to get the best of it. Here you can read about my quest of going up, as I went hiking and climbing in the Swiss and Italian Alps in the summer of 2010. You can also read about my recovery after surgery, my view on life and more that can be of value to others in similar situations. I will continue telling tales of my adventures in hopes that it will inspire others, despite limitations.